Don Trella’s record — available at boxrec.com — is impressive. Trella, 63, has judged 804 professional boxing matches since 2002. In the three years before he turned pro, he judged more than 500 amateur bouts. 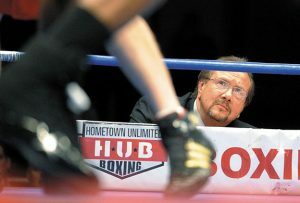 When Trella, a Prospect native and former Holy Cross High football player, enters the Connecticut Boxing Hall of Fame later this year as an official, he brings with him 21 years of work as a judge for more than 1,300 fights and a remarkable 65 world championship bouts. Trella has done it all, from three-round amateur bouts in street-corner gyms to title fights in the world’s most famous arenas, like the Gennady Golovkin-Canelo Alvarez world middleweight fight in Las Vegas last September, the Golovkin-Danny Jacobs world middleweight fight last March in Madison Square Garden, to the big one between Vladimir Klitschko and Anthony Joshua for the IBF, IBO, and WBA world heavyweight titles in front of 90,000 fans at London’s Wembley Stadium in 2017. And the bell has tolled for Trella with Connecticut’s boxing hall. On Oct. 13 at the Mohegan Sun, where he also works as director of employee and guest experience, Trella will be enshrined along with John Harris, Bill Gore, Brian Clark, all trainers, and boxers Cocoa Kid and Angel Vazquez. Trella joins other local inductees like Naugatuck’s Joe Rossi. Byrd won the split decision. Trella had it for Byrd, 115-112. “It took a lot of nerve for the state commissioner to have that much trust in me,” Trella said. Trella has been covered with an avalanche of trust ever since. You don’t earn 64 more world title fights if you don’t get it right always. The same thing happens even outside the prize ring. Trella feels the nerves, too.